The workstation of the future for the multilingual professional. All that is missing is a pellet dispenser. Perhaps some enterprising LSP will hook up these treadmills to generate green energy. Miguel Llorens is a freelance financial translator based in Madrid who works from Spanish into English. He is specialized in equity research, economics, accounting, and investment strategy. He has worked as a translator for Goldman Sachs, the US Government's Open Source Center, several small-and-medium-sized brokerages, asset management institutions based in Spain, and H.B.O. International. To contact him, visit his website and write to the address listed there. You can also join his LinkedIn network or follow him on Twitter. Miguel, the pellet dispenser is available as an option. It will be included in the upcoming ProZ Group Buy. Ooooh, a Group Buy! I'll make sure to get up early that day! A nice touch: the CAT repository to the left of the treadmill walksurface. I've already built myself a standing desk, because my lower back and legs were getting mummified from sitting all day. Result: my friggin' heels are about to explode. Thus, I can clearly see a treadmill in my near future, because nothing can ever be more pathetic than the tip-toeing faux Balinese dance I'm doing right now as I type this. Actually, I improvised a standing desk because I can’t stay sitting for long periods of time. 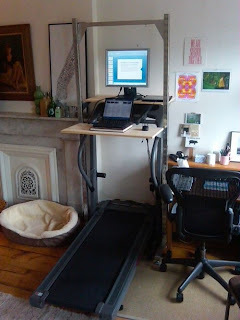 And I ran across an entry in Corinne McKay’s blog a couple of years back on her treadmill desk. Of course, Corinne is no hamster. But the treadmill desk is a bridge too far for me. There is actually a souped-up $500 version on Amazon.